An early start for all classes led to an interesting mix of conditions with wind speeds building and dropping off throughout the day with a building tide against the passage through the Sound of Mull. All onboard shook off the clutches of sleep and put on a happy face ready for racing! 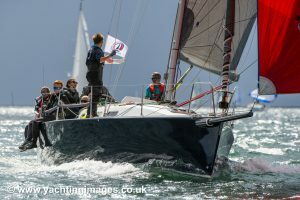 Racing started on time for all classes, bar class 7 who seemed almost too keen to get their pontoon berth in Tobermory… All competitors had passed through Lady’s Rock by around 8:45, after this the pace really began to snowball. With wind just aft of the beam many of the fleet hoisted reaching kites with these being exchanged or peeled for their larger running equivalents as the wind continued to track back. At this stage class 1 began to separate with many of the class heading high to get the early benefit of fresh wind whilst others sailed a straighter course risking the effects of the tide. The sail through the sound, past Salen, really took the biscuit with a gradual bear away and the first signs of Tobermory appearing off the bow. Most of the fleet chose a shoreline route, sticking to the wafer thin shallows with several gybing battles ensuing. Although the wind looked favourable in the main channel, many yachts stuck to this tactic as they likely feared the deeper water would be like sailing through pure caramel with no hope of rolling across the competition. A few yachts ventured out into the channel and it paid dividends as the wind swung forwards and filled in strongly, giving the boost they needed to pull away from those behind to close the gap to the front runners. After this it was only a short round up outside the bay at Tobermory and across the finish line. Racing finished in high spirits with all competitors happy with their performance and ready for a well deserved pint in the Mishnish (other brands of Tobermory hospitality are available). A special mention to Wildwood, with the youngest helm barely able to see over the wheel! They prove that West Highland Yacht Week is still truly a family business. And also to our great friend and crew member Fiona Rae who celebrates her birthday today! Thanks to all racers, organisers and sponsors for what has been a brilliant week so far with more yet to come!